Shady sandstone bouldering area in Santa Barbara. High density makes this a very enjoyable area. There are some great taller problems, and a few excellent traverses. The rock quality is very good for the most part, but the area is relatively small. Take West Camino Cielo off the 154 in Santa Barbara. Short approach, 10 minutes or so down hill. Unfortunately, the A-holes responsible probably don't read this site or king-dino.com. We should post the rant at the entrance to the Brickyard. As a community we need to CONFRONT the people disrespecting this fantastic area. I recently had a very disappointing interaction with someone unnecessarily chopping a tree and clearing a landing. This is only one instance of some of the crappy stuff I have seen. Hey, was just wondering if anyone had any info on this problem here. I think it's on the Great Shark Hunt (40' traverse) boulder, but the only mentions of problems here in the guidebook (O11) were Lets Troll! and Chummin', each of which descriptions don't seem to match this problem. I was starting on the big lip, moving up passed crimps to the sloping rail and then using some balancy moves passed slopes to gain the top. Just curious as I haven't seen anyone else work it, but it seems to be a great problem. Brickyard rips. Made this little video (sorry for crappy video quality) for this climb 'cause I had my camera and it's actually quite a fun climb. Was wondering if you went about it similarly? Does anyone know anything about this route. Its on the same boulder as the picture above. Its on the face just left of the arete. 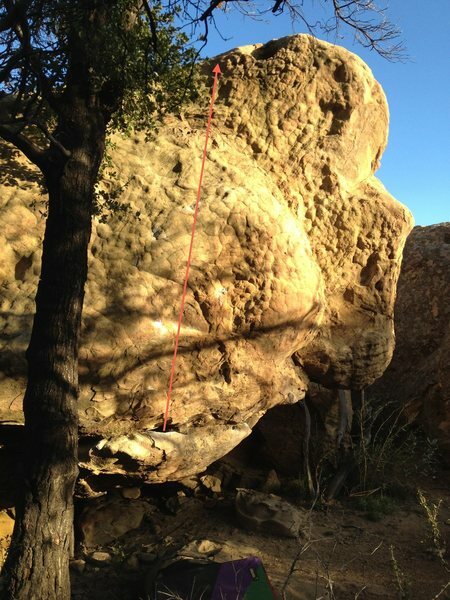 It pretty much goes straight up on slopers and a couple smal crimps. Feels like a 4 maybe 5. Hey there, climbing community of SB. For the second time in the last year, I've had to mitigate forest-fire potential at the Yard'. On Friday night some campers dug a fire-hole directly under Grotesque Old Woman, and when I arrived for a bouldering session on Saturday morning, there was a SMOKING PIT OF ASHES. It was a hot and dry day, with a steady breeze. Eek. Needless to say, my friends and I had to sacrifice most of our drinking water to douse the pile of embers. That's not how I like to end a session of rock-climbing. A) take a deep breath, remember that many of this generation were raised by the show "Jackass", and strongly discourage behavior. I vote for option "A". I have many friends who lost property and/or possessions in the Tea and Jesusita fire. They might not be so understanding. Really though, it's a lot of your little 'reminders' that have inspired some of the things I now do, such as always bringing a bag to pick up trash (makes it super easy to grab the little stuff, like cig butts, tape, cans etc) and just generally trying to leave the area nicer than you found it. Deep forest arete->Way Under->Way under traverse->Charlotte's Web->Yeti->Watch the Dog->Smooth Criminal->Your project or move areas and keep it going with whatever problems you can think of. For a bonus do it in under 5 minutes. Okay, here's what I always did (back when I climbed there a lot): warm up on Yeti (3X), run up the hill and do Watch the Dog (3X), then Soot Patrol to the lip (3X), then finish by doing Akiba's Prison as many times as you can. If you fall off the latter problem before the end, get back on immediately and climb as far as you can. The left side circuit is a bit more moderate but great at well. Usually the Coffee boulder amphitheater, to South Street, then Extremist, Shoehorn and finish with Font Problem. Nice, that was our idea too Andy...how to get a good workout in when you only have a little time after work. Doing many laps on Akiba's is definitely a good way to accomplish this. Another one I used to try to do was a 4X4 consisting of Yeti, Sasquatch, Watch the Dog, and Soot Patrol to the lip. Not the most ideal since you have to do some running around but will get you pretty tired nonetheless and you can add harder variations of the problems if needed. 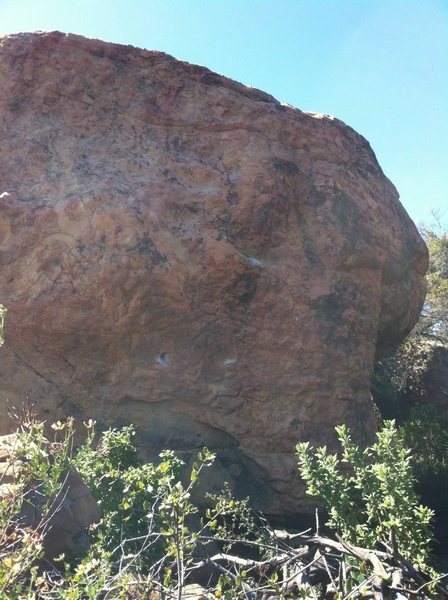 This is a fantastic boulder field, especially in the V5-V9/10 range, with some legitimate classics.